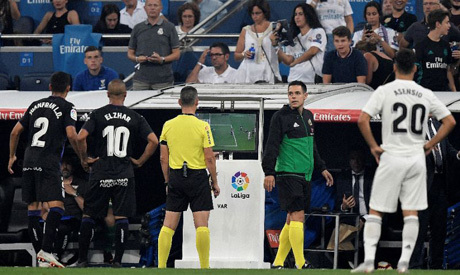 VAR has had a positive impact in its first season in La Liga despite recent criticism, the Spanish Football Federation's referees committee insisted on Tuesday. Video technology has been introduced to Spain's top flight this term, with the Champions League and Premier League both set to adopt it in 2019-20. Controversy has remained in La Liga, however, with Real Madrid, in particular, left disgruntled by decisions that have gone against them. Vinicius Junior was denied a penalty in their defeat to Real Sociedad earlier this month while on Sunday, Madrid thought Sergio Canales was offside before scoring against them for Real Betis. With La Liga's season now halfway through, the Spanish Football Federation's Technical Committee of Referees held a press conference on Tuesday to review the impact of VAR so far. "Our analysis is that it has been positive during the first half of the season," the committee's chairman Carlos Velasco said. "We are satisfied by the performance of the referees, and the success and integration of VAR. "The essence of football has not been lost. The time taken and the number of interventions have preserved the fluidity of the game." Real Madrid's coach Santiago Solari has claimed he does not understand the process of VAR and, in a separate press conference at the club's training ground on Tuesday, said he was "confused" about the "discretion" involved in selecting incidents to be reviewed. FIFA's rules state VAR can only be used for decisions relating to goals, penalties, red cards and cases of mistake identity. A request for a review can be made by the referee to his video assistant or vice-versa, by a video assistant to the referee. According to the committee's figures, VAR has corrected 58 mistakes in 190 La Liga matches this season. "Referees make errors, of course they do, but we are satisfied that the percentage of errors is reduced," Velasco added. "VAR is not perfect, we've always said that, and we have to work on achieving a smoother process between VAR and what happens on the field."